Tracing Italian families is not that easy. The parish priests are still keeping the parish registers which can be difficult to gain access to and the language barrier can be high. I haven't tried to research in Italy myself but through other channels I have been able to find a good deal about the Mazzanti family (or families) - the origin of the Danish Mazanti family. According to American genealogist Kenny Mazzanti the oldest mention of the name dates from 985. I suppose this is about the place name Mazzanti (Masanti, more about that below). Family names weren't common in Italy until much later - in the 14th-15th centuries. There is a period of 500 years until the first informations I have been able to find about persons using Mazzanti as a surname. Beginning in the 15th century many of them lived in the area around Lucca, a beautiful medieval town in northern Tuscany. 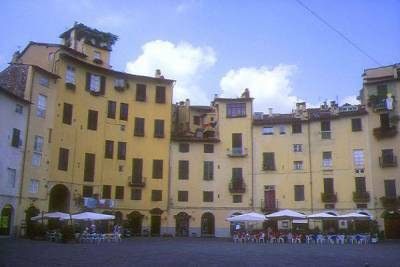 Iacopo Mazzanti, born about 1487, lived in Lucca itself where many persons with the same surname were born during the 16th century. Probably they were his descendants or close relatives and they had names like Iacopo, Bartolomeo, Mariotto, Battista, Giusto and Marco. In the small town of Montecarlo, 10 miles from Lucca, lots of Mazzantis were born in the period of 1547-1646. I have also found mentions of the name in 18th-19th century Tuscany, among other places in Florence. You get an interesting result when you look at the spread of the Mazzanti name in modern Italy. Many persons with the name are living in the large cities of Rome and Milan but most of them are living in a quite limited area in Central Italy. The spread of the Mazzantis forms a zone across the "Italian boot", coast to coast. There are still many in northern Tuscany where you find the towns of Livorno (Leghorn), Pisa, Lucca and Florence. Towards the north east the "Mazzanti Zone" is crossing the Appenines, Italy's central mountain range. It broadens in the province of Romagna (today the eastern part of the Emilia-Romagna region) and includes, among other cities, Bolagna and Ravenna. The zone ends in the south east in towns along the coast line of the Adriatic, towards Ancona. The strong concentration of the name in Toscany and Romagna makes me think that Mazzantis have lived in both provinces for centuries. A fair distance noth of the zone, in Verona, the name is mentioned as early as 1527. Click here - to form a map of the Mazzantis's spread in Italy (and in the USA). Type "mazzanti" in the "Cognome" field. I think that the family got it's name from Masanti (Mazzanti), a place name in the beautiful valley of Val di Taro (Valtaro), about 75 miles north of Livorno - between Parma and La Spezia. The name includes two neighbouring villages, Masanti di Sotto (Lower Masanti) and Masanti di Sopra (Upper Masanti) which is situated 258 metres above on a mountain slope. You'll find the place in the Emilia-Romagna Region but the distance to Tuscany is very short. The forefathers of the Mazzantis could be emigrants from Masanti. During the later Middle Ages they have left the harsh life in the mountains. Some must have gone to the east, settling in the plains of Romagna. Others migrated to the south, towards the affluent Tuscany and became forefathers of the Danish Mazantis and other families. At least that is the picture my imagination has created! 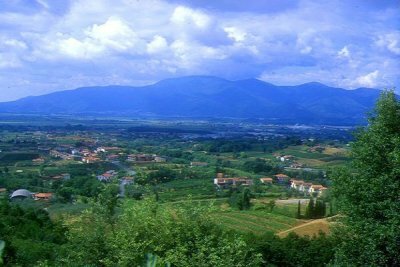 Val di Taro is situated where Tuscany, Emilia and Liguria border on each other. In this montainous area important European pilgrim's routes met in the Middle Ages. The so-called Via Francigena (the French Road) lead travellers towards the south (and passed by Lucca, among other places). Pilgrims on their way to Rome or the Holy Land, soldiers and craftsmen, kings and priests, all of them have passed the valley and it's main town, Borgo Val di Taro at the Taro River. Many fights were fought over the strategically important town and powerful noble families, dukes and popes controlled it by turns. The unrest must have affected the mountaineers in Masanti - it's not strange that some of them chose to look for new pastures. 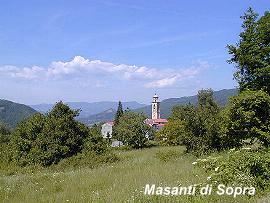 More photos from the surroundings of Masanti on Valtaro Network's Website. The first Mazzantis in Tuscany lived in a region which importance for the world's history is very great. The towns of Tuscany were the vigorous centres of the Italian Renaissance. A fantastic rise in European art and culture radiated from Italy in the period of 1400-1600. The growing trade of the later Middle Ages had created affluent towns with local patriotic citizens, using art like status symbols. Florence and Lucca were among the leading towns, achieving wealth by banking and the textile industry. The wool and silk factories created new jobs and I imagine that peasants from Masanti went to the south, looking for a future as textle workers in the independant town of Lucca. In this map of Tuscany you can find some of the places where the family belonged. In the upper, left corner - in the white area, a few miles north of Tuscany - Borgo Val di Taro is situated, the main town of the Taro Valley, at the Taro River. The two Masanti villages aren't marked but they are near by. Down the coast you can find Livorno (Leghorn), a little inland Lucca is situated. According to tradition the forefathers of some American Mazzantis had "royal status" in Romagna. Tales of royal or noble ancestors do exist in many families, in Denmark some Mazantis also have talked about nobility. Estate agent Ester Mazanti once returned from Italy with a Mazzanti coat of arms. The database of the Latter-day Saints contains a Countess Florina Mazzanti and the artist Ludovico Mazzanti, born 1686, belonged to a noble family ("di nobile famiglia") in Orvieto. But even if a Mazzanti once was raised to the nobility it doesn't mean that all Mazzantis are noble too. Actually nobody is able to know if all the different Mazzanti families can be traced back to a common ancestor. If he ever existed he must have lived before 1500. No doubt exists about the family name's original spelling, that's Mazzanti with two z's. The Italian name bearers have spelled it like that since ancient times. Apparantly one of the z's sometimes disappears in connection with emigration. In Denmark the name of the first Mazanti, barometer maker Joseph Anthon Mazanti, was never spelled Mazzanti (in return other variants sprang up!). In the USA some Italian immigrants about 1900 also came to be named Mazanti but however, most of the Americans have kept the original spelling. The Italian pronunciation of the name is "matsandi". The barometer maker and his children said so too - I conclude that from the spellings in the parish registers of Odense etc. about 1800: Matzandi, Mazandi, Masandi, Massandi. I would love to get in contact with researchers with knowledge about the origin of the Mazzanti name and the Mazzanti families. I'm fully aware that the picture I have painted here might need a correction if new sources do turn up. My e-mail adress is henbra@kabelmail.dk. Lots of informations about people and places in Italy I have found in the internet, combining "Mazzanti" and several keywords in Google. 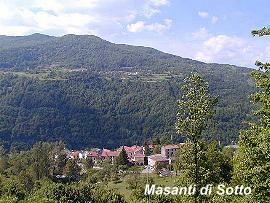 The place names Mazzanti and Masanti can be identified as the same villages at http://www.fallingrain.com/world/. 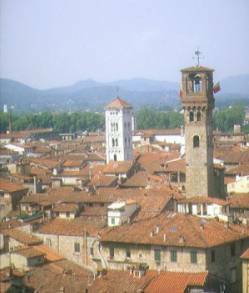 The informations about Mazzantis in Lucca and in the rest of Tuscany come from the Latter-day Saint's database, http://www.familysearch.org/.